With a high degree of probability we can now say that on July 17, 2014 there was intentionaly shooting down of civilian aircraft to achieve political goals. 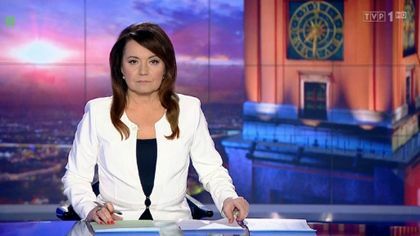 The Ukrainian authorities play a significant role in the obfuscation of the investigation regarding to the shooting down of the Malaysian Boeing MH17. 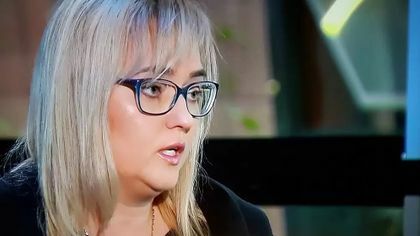 The Ukrainian authorities also offer protective umbrella of the participants in the pogrom of May 2014 in Odessa, or the ordinary war criminals from the so called nac-guards operating in the Donbas. 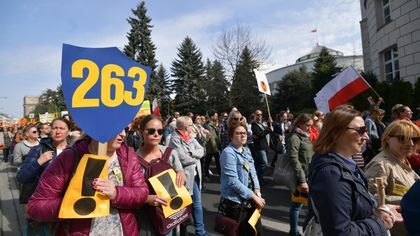 This is nothing surprising in it, since Ukrainian murderers of Poles in Volyn (1943) are now the greatest Ukrainian heroes and the Ukrainian authorities threaten with jail anyone who dares to speak ill of NaziBandera soldiers from criminal formations of OUN-UPA. 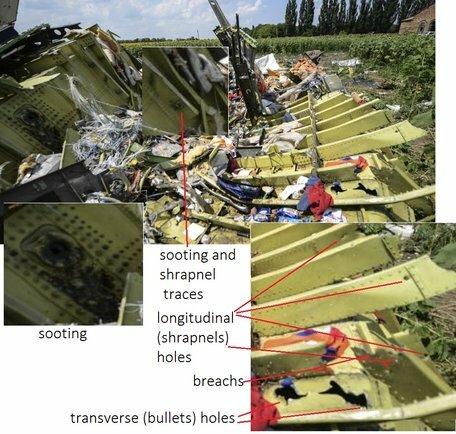 Amazingly in obscure matters of downing the Boeing MH17 help the Dutch engineers working in the DSB and the NLR .Contrary to engineers, Dutch society in the referendum instinctively rejected the assistance to Ukraine in association with the EU. 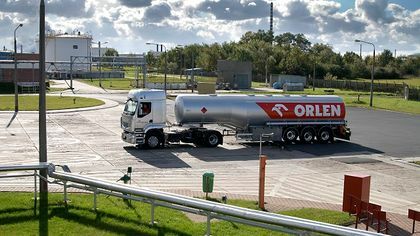 The motivations of Dutch engineers to obfuscate things are so great that they not watch to ridicule and criticism with which they must meet with the independent circles of specialists in this field. 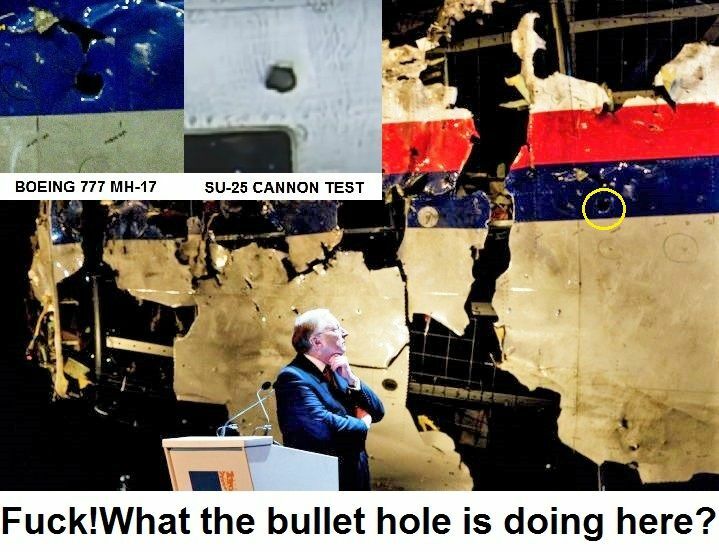 In my note : http://blogdoradcy.salon24.pl/720484,what-really-burst-the-boeing-flight-mh17 I showed that DSB does not deigned to refer to the obvious signs of rocket in the Boeing belly, and now reveal clear signs of bullets holes from the cannon found on the Boeing cockpit. 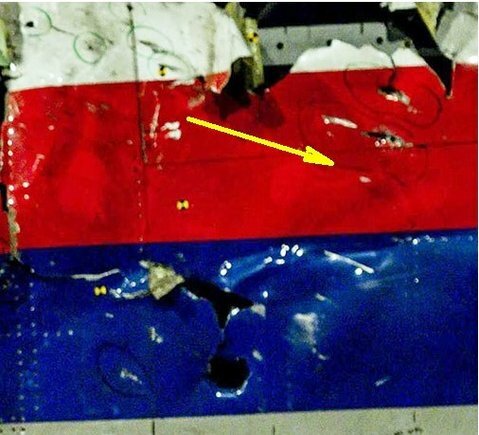 Fig.1 The hole in the cockpit behind the chairman of the DSB clearly resembles trace of the 30mm bullet( source [http://static.independent.co.uk/s3fs-public/thumbnails/image/2015/10/13/13/MH17-report.jpg]. 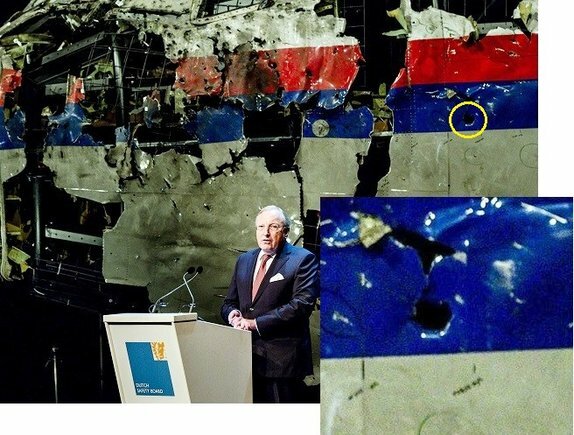 In Figure 1 chairmen of the Dutch Safety Board's Tjibbe Joustra presents DSB report on MH17 13-10-2015: Behind him is seen one piece of evidence that does not fit to some of the theses of the report. This is a separate opening, which is most likely a hole after firing a 30mm (or20mm) bullet. Fig 2. 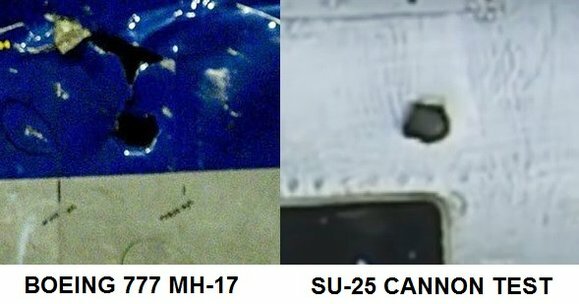 On the left the hole in the Boeing Mh17.On the right the inlet hole from bullet 30mm Russian Army assay. Fig.2a Comparison :discribed hole versus the inlet hole from bullet 30mm Russian Army test. 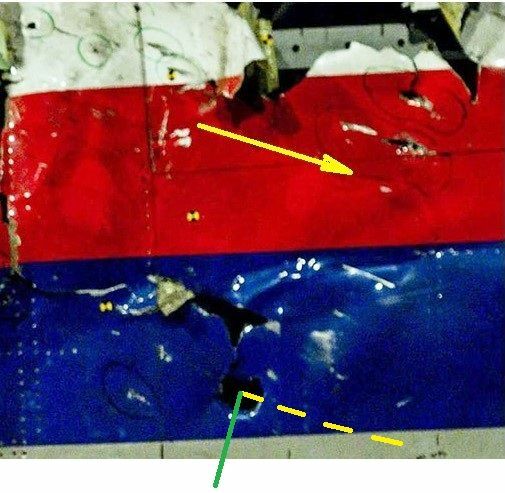 Hole deceptively resembles some of the inlets holes of projectiles caliber 30mm Fig.2 and 2a fired from aircraft cannon S-25 fighter jet in an experiment conducted by the russian army. Right-hand opening on Fig2 is shown in fig.39 appendix X Analysis DSB (NRL). Fig.3 The yellow arrow shows the direction of BUK shrapnels. Direction of the bullet mark is different. Moreover, the hole in the Boeing is made almost perpendicular to the cockpit surface (with a slight deviation to the right down), which clearly differs from the other tracks in the surrounding area. Fig3 and 3a , Traces of other shrapnels in the area running from left to right, showing the direction from which flew Figure 3. This direction more or less agrees with designated by the DSB location of the rocket BUK at the outbreak This suggests that this hole couldn't be the hole after BUK shrapnel , but could be a hole after firing a projectile caliber 20 or 30 mm . Fig 4. The view from inside of the cockpit. 1,2-holes made by bullets about 30mm. 3-shrapnels traces . 4 - breach in ribbing. Figure 4 shows the same discussed opening (no 1) from inside of the cockpit .Next is visible second opening (no 2) of similar diameter. Between the holes breakage occurred Both holes are roughly perpendicular to the hull. The hole 1 is surrounded by the petals growing from a single point. This means that the striking body had pointed tip that fits to the shape of the missile from aircraft gun. 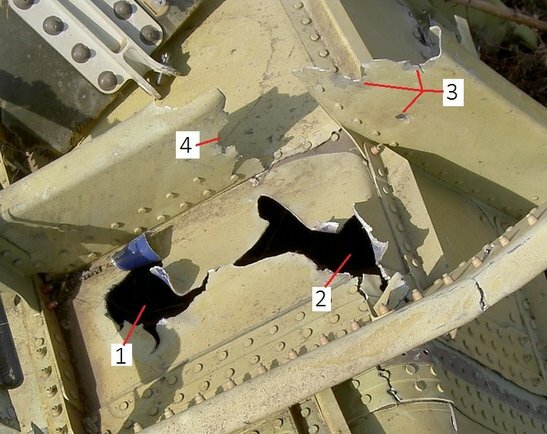 Please note that the holes after BUK shrapnels shown in the picture No. 9 of the Almaz Atney experiment are smaller and practically free of this type of the petals. Sooting and destruction of perpendicular to the hull surface ribs can be explained by the presence of projectiles exploding after penetration Fig. 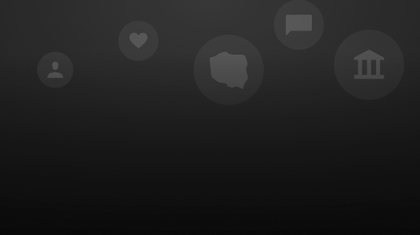 6 and Figure 7 and Figure 8. The figures 6,7,8 presented the same part of the roof of the cockpit.